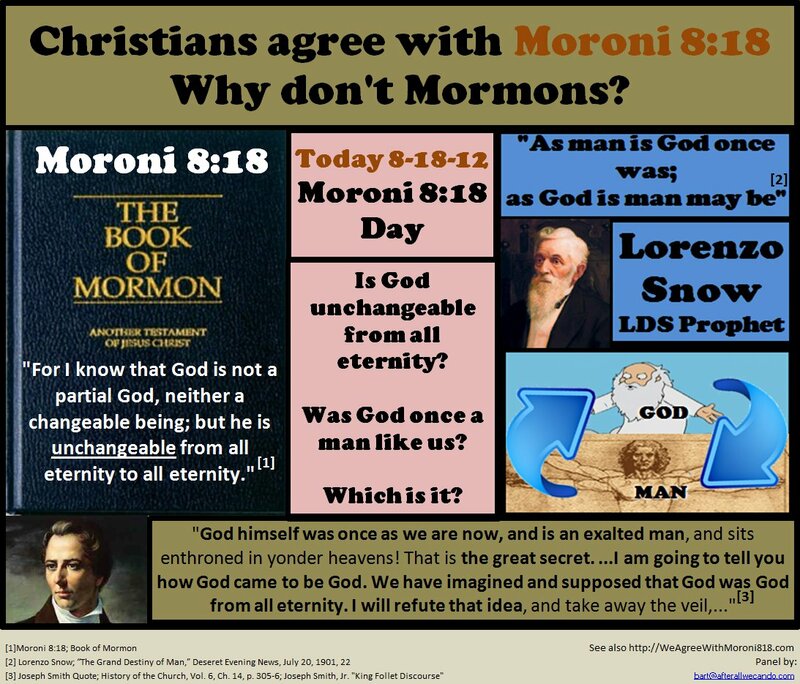 Mormon Infographics: Christians agree with Moroni 8:18; Why don't Mormons? Christians agree with Moroni 8:18; Why don't Mormons? "For I know that God is not a partial God, neither a changeable being; but he is unchangeable from all eternity to all eternity." Joseph Smith Quote; History of the Church, Vol. 6, Ch. 14, p. 305-6; Joseph Smith, Jr. "King Follet Discourse"
"God himself was once as we are now, and is an exalted man, and sits enthroned in yonder heavens! That is the great secret. ...I am going to tell you how God came to be God. We have imagined and supposed that God was God from all eternity. I will refute that idea, and take away the veil,..."
I think you probably understand in this context what is meant by unchangeable, but I also think you have brought up an exceedingly difficult problem for many people. Some folks believe that Jesus, his Father and the Holy Ghost are all the same person. Is there any changing involved there? Even more problematic as far as the simplistic idea of God not physically changing, is Jesus himself. What was Jesus before he came to earth—a spirit personage. But then he was born here and was a mortal! Is any of that changing? He naturally started out a baby and grew into childhood, then a teenager and finally an adult. Any changing there yet? All the while “the child grew, and waxed strong in the spirit” (Luke 1:80); “And Jesus increased in wisdom and stature, and in favour with God and man” (Luke 2:52); “And I, John, bear record that I beheld his glory, as the glory of the Only Begotten of the Father, full of grace and truth, even the Spirit of truth, which came and dwelt in the flesh, and dwelt among us. And I, John, saw that he received not of the fullness at the first, but received grace for grace; And he received not of the fullness at first, but continued from grace to grace, until he received a fullness;” (Doctrine and Covenants 93:11-13). Still no change yet? Then Jesus died on the cross. What was he then—a spirit personage again! Surely we have some change by now. But the change is not nearly finished; he then was resurrected and glorified and sat on the right hand of his Father! And all this change by the person you (and I) call God the Almighty. Were any of these radical changes in Jesus or God, phony? No, they were all very real and necessary or Jesus was a fraud. It is obvious that Jesus or God did a considerable amount of changing physically. 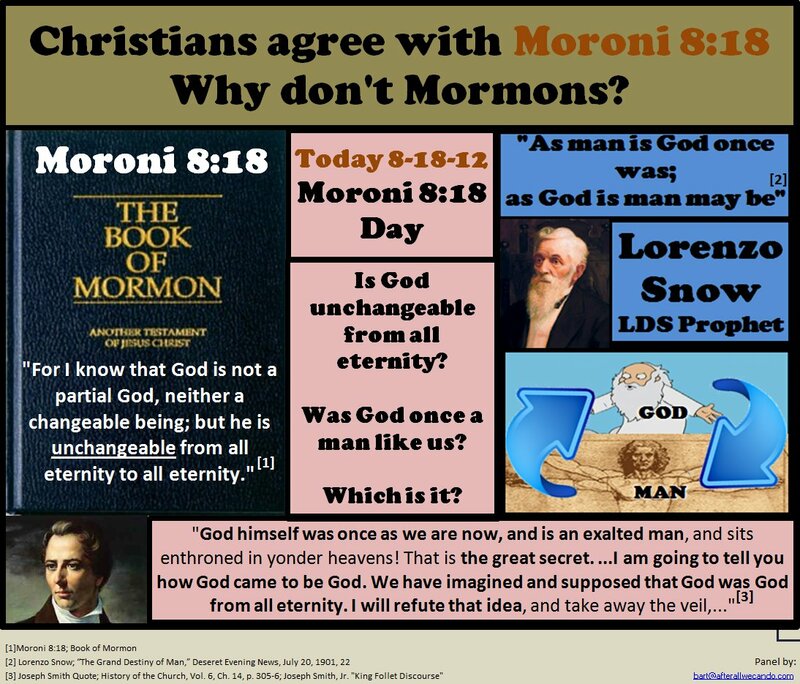 Was God or Jesus once a mortal man like us, it is ridiculously obvious. So the reference to being unchangeable, though perfectly accurate, has a different meaning than most people think it has and is far too complex to explain here. I don’t believe anyone would seriously care about it anyway.